Zucchini Tomato Eggplant Bake is a perfect recipe to use those amazing garden vegetables. A one-pot wonder eggplant zucchini bake that is perfect for a meatless meal. This is a favorite go-to, use up my favorite garden veggies and enjoy recipes! An awesome combination of diced eggplant topped with a fresh zucchini and tomato bake. The yummy veggies are topped with low-fat mozzarella and Parmesan-Reggiano and you have this amazing low-carb vegetarian meal. If I don’t remind myself of moderation, I tend to gain a pound or two in the summer. Perhaps it’s my love of ice cream, fun drinks by the pool, ice cream, and drinks by the pool, do you see why I could gain a pound or two, see my issue! The key to keeping the weight in check, besides daily exercise, is eating in moderation! Whether you grow your veggies, get them from a neighbor, CSA, or your local farmer’s market, this is a perfect summer recipe. A very light recipe that will leave you full but not that bloated I need a nap now feeling. Eggplant zucchini tomato casserole is a great combo of veggies. This low-carb meal is just as delicious at room temperature so a great bring along for lunch, pot-luck, or a picnic! Being that this meal is so low in carbohydrates, feel free to enjoy the eggplant bake with a loaf of warm Italian bread. The bread is excellent to soak up the juices that come from the veggies! Do I have to peel the vegetables before using in this eggplant zucchini bake? I prefer to peel the eggplant, but if your family likes the skin on, well then leave it on! The zucchini, leaving the skin on makes an attractive presentation of the finished meal. Can I change the type of tomatoes in this zucchini tomato bake? Any tomatoes will work, feel free to use what is in the garden or what is fresh at your market. Feel free to also use yellow or orange tomatoes. Are you vegan or dairy-free and do not eat cheese? What can be substituted for the low-fat mozzarella and Parmesan? Use your favorite vegan cheese and also use coconut oil to saute the eggplant. What can I substitute eggplant with, some family do not like the flavor? I get this a lot, I love eggplant but not everyone does, I would suggest portobello mushrooms, butternut squash, or tofu. Can I make Zucchini, Tomato, Eggplant Bake recipe in advance? You can make the full recipe and either reheat it or eat at room temperature. This eggplant recipe can also be reheated. I often prep this up to getting ready for the oven the night before. I keep the dish in the fridge until ready to eat and add the cheese and heat to warm the veggies and melt the cheese. How do you make Zucchini, Tomato, Eggplant Bake? In an oven-safe skillet, heat olive oil, saute diced onions. Add eggplant and saute to soften about 5 minutes. To the pan, add oregano, garlic, salt, and pepper. Saute 3 minutes. Spread the eggplant evenly in pan. Remove from heat. Top with mozzarella. Place the zucchini and tomato the eggplant mixture. Top eggplant, zucchini bake with Parmesan cheese and basil. Place back in the oven to melt cheese. Originally published August 1, 2016. Recipe updated and video added September 2017 Hope you enjoy! Are you loving my favorite one-pan wonder Zucchini, Tomato, Eggplant Bake, giving it a 5-star rating is super helpful for me and very much appreciated! 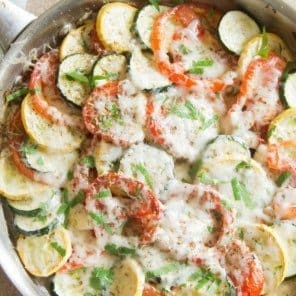 Super easy one pan vegetable bake with the addition of low-fat mozzarella and Parmesan Reggiano. Perfect on its own as an entree. Have this vegetable bake with a loaf of Italian bread to soak up the juices from the veggies. Perfect hot and at room temperature. In a 10-inch round oven-safe pan, over medium heat, add olive oil. Saute the onion about 1 -2 minutes to sweat the onions. Add the cubed eggplant and stir frequently until they are soft about 8 minutes. Stir in the minced garlic, fresh oregano, season to taste with salt and pepper, continue to stir about another 3 minutes. 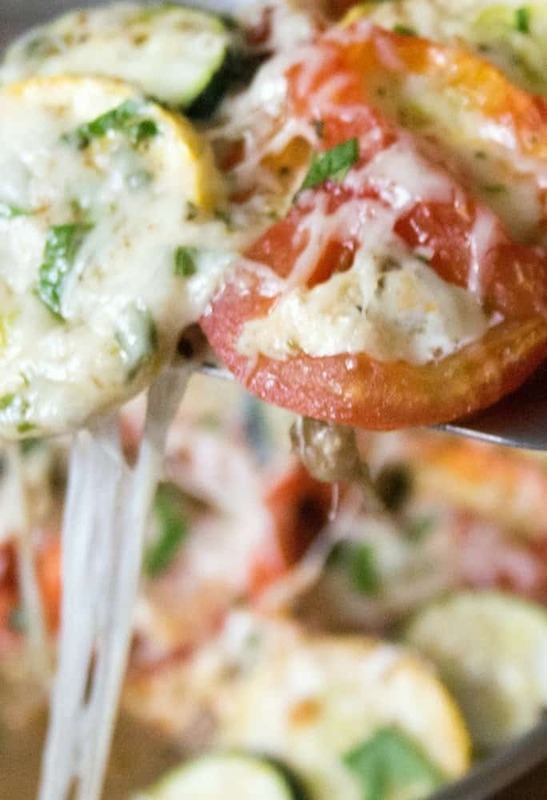 Remove from the heat and top with the low-fat mozzarella cheese slices. Top the eggplant/cheese mixture with the zucchini and tomatoes, alternate the veggies to cover the eggplant. Remove from oven. Top the vegetables with the Parmesan cheese, basil. If needed, season with salt and pepper. Ready to serve. Can also be served at room temperature. Use heirloom tomatoes or yellow tomatoes when in season. 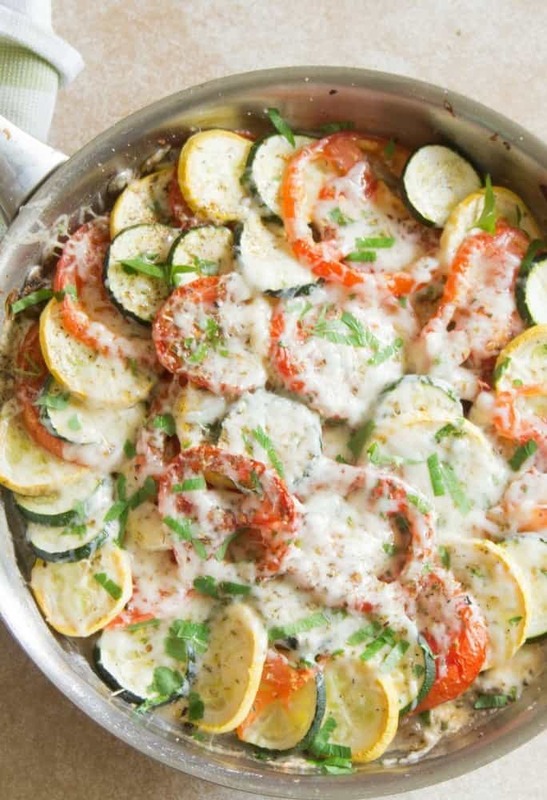 Want to make this zucchini tomato bake to make later, save it on Pinterest HERE. This is a great way to use up that garden zucchini I love the tomato and eggplant addition to the zucchini! I cannot wait to try this! Thank you so much for loving the recipe Kelsey! Enjoy! Absolutely gorgeous! Very easy to make, beautiful presentation and such a great idea for a vegetarian side dish. Perfect for the upcoming holildays and love all the fresh ingredients. Thank you, Heather! Glad you enjoy and keep making through the last of summer harvest! This looks like a perfect way to use up that end of summer produce. Love this flavor combo, and I’m always down for anything covered in a layer of cheese. YUM! Portobello mushrooms are a great suggestion for switching things up – I know a lot of eggplant haters. This dish seems super versatile! Thank you Ashley! I am so glad you enjoy this one! I too love a great layer of cheese on anything! After a slow start to the season, my garden is literally overflowing with tomatoes! I’m definitely trying this recipe! Kitty, so happy your garden is growing! This is a perfect recipe to use with those veggies! This couldn’t come at a better time! We just picked a TON of eggplant and zucchini from our garden. I love love eggplant especially when it’s covered in cheese! Excellent Lauren! Enjoy and I am a little jealous, no eggplant for me in the garden this year! I will not make that mistake again! Serve me this dish any day anytime and I’ll be one happy soul, comforting and healthy dish. You made my day Jagruti! Enjoy the recipe! This recipe makes me so so excited for fall! Love anything baked and especially veggies all season! Awesome Lorie! I hope you enjoy as much as my family and I do! I love this! I am always looking for vegetarian low carb sides like this one to serve along with a roast or some grilled steak! I will defs bookmark this one! The video is super helpful as well! Yum! This is all the best things from my garden this year. I would love to serve this alongside some grilled chicken! This is a great side to grilled chicken Jenni! I hope you enjoy! I am so glad you enjoy Aleta! These are a great way to use garden veggies! This would be so perfect for a dinner party! It looks so yummy! Absolutely Kelly, these are great for a party side! My two favorites!!! This looks so amazing and fresh! Glad this is so versatile – I didn’t have any fresh basil or oregano, just used dried. Added extra garlic and mozzarella, used only one zucchini and one large yellow tomato from my garden. This was DELISH! Served along with chicken and pasta with Alfredo sauce. I could’ve eaten just this, it was so yummy ? Nancy – I am so happy you enjoyed this recipe! Sounds absolutely delish with chicken and pasta! I agree that this one is so versatile using fresh or dried herbs, always get great results! I also love yellow tomatoes..I wish mine were ready!